The Hiroshima Peace Memorial Museum's Peace Watch Tower, which records the number of days since the last nuclear test, was reset on October 10, one day after North Korea conducted an underground nuclear test. The peace clock's two digital displays show the number of days since the US atomic bombing of Hiroshima and the number of days since the last nuclear test was conducted. Before being reset on Monday, the clock read 40 -- the number of days since the US conducted a subcritical nuclear test at the end of August. 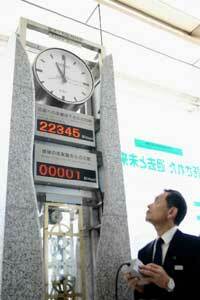 The clock was set up on August 6, 2001 on the 56th anniversary of the 1945 U.S. atomic bombing of Hiroshima. Over the past 5 years, the clock has been reset 11 times following each of the nuclear tests conducted by the US (some in cooperation with the UK) and Russia. Museum director Koichiro Maeda says, "We are concerned that more nations will start to believe their national security can be strengthened by possessing nuclear weapons. It is extremely foolish." The museum is now considering making room for North Korea in the reference library exhibit, which displays information about nations possessing nuclear weapons. About 300 survivors of the Hiroshima nuclear bombing gathered in the park near the museum condemning the possession and testing of all nuclear weapons by all nations. Only 40 days since the USA did a nuclear test? If America has/tests nuclear weapons, how do they expect North Korea to listen to their demands? More people should be listening to the complaints of the A-bomb survivors... they seem to have the most relevant perspective. GrandMaster, you seem like such a swell guy. I'm sure the "N. korean mofos" have every reason in the world to love you. Peace. If you have an opportunity.. visit both the Hiroshima and Nagasaki bomb museums. I have. I guarantee you will walk away a changed person and learn a few facts about the war often not shared those of us that are products of the U.S public school system. I sure was changed.